What is the difference between a sliding stop and just a stop? “I have probably a silly question, coming from another breed/discipline. Never thought of doing stops before I watched Stacy with Jac. 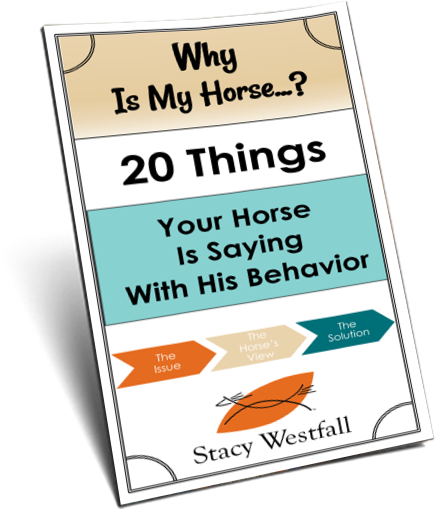 When Stacy emphasized some of Jacs physical qualities, I was encouraged thinking about my horse’s ability to try it. My Paso Fino has a really good build on him (lots of Andalusian closer in his bloodline). So anyway, whats the difference between a sliding stop and a short stop (and any other kinds of stops)? All horses can stop…physical ability will determine the finesse and the style. The only real difference between a short stop and a sliding stop is style and intensity which is why it is possible to see amazing ‘sliding stops’ with horses running free in the pasture. Imagine if you were driving a vehicle down the road and came to a sign that told you to stop and back ten feet. If you were driving a little electric car vs driving a dump truck or a Ferarri…. all could perform this ‘maneuver’ but they would have different styles. I suggest teaching all horses to stop well. In my “Whoa” video I show three separate cues that I teach to stop a horse…and they are also the key to my ability to ride bridleless. I also wrote a blog that featured a part Saddlebred to slide like a reiner and she tells how she achieved this. Often the biggest problem that people have with stopping their horse is that the horse was never fully trained to halt and back up well. Again, it isn’t the breed as much as the amount of heart and the physical build that will determine how much slide you get. Wow! Thanks Stacy for answering!!! Awesome!!! I guess I have to work on teaching him leg pressure better first… although he’s already had a successful show career (Reserve National Pleasure CH, PFHA), Pasos are traditionally trained with no leg at all (“go” is a slight lean forward, and after that keeping speed down is the challenge, haha). I was warned when I got him not to apply leg or we would find ourselves on a trip to the moon, but since I have been practicing NH with him the past year, he has gotten fairly desensitized to it (using a ground exercise of arm over the back while having him walk in circles) but he is still learning. I look forward to getting your dvd set! So you can see the “go”… This is him ridden by the trainer right before I got him. Stacy……WOW!! ………my very own BLOG??? …… I can hardly wait…. I feel so dumb asking so many questions…… but I guess if I don’t know something……… ASK!! …..Thanx!!!!! This is a good topic … I have a follow up question to whoa … Should whoa only be used to stop versus slow down or gate transition? Should the queue to slow down or transition gate be non verbal? 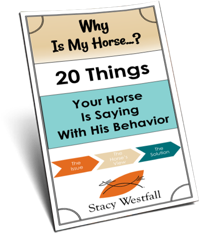 I have worked deligently to encourage my horse to stop on whoa… for riding and ground work as whoa seems like the most important verbal queue in my tool box and especially in a critical moment. Sliding stops will range from a foot long to several feet, up to 20 or even more at major shows. This depends on the ability of the horse, his training, his speed and the footing. Usually a faster horse will be able to produce a longer stop. For example, my QH usually stops 10 feet at home, but with great footing and a little show stress, will stop up to 18 feet long! J_Ann ….thanx for replying…….I know what a sliding stop is…. I was just wanting to know what size the shoes were….. Stacy said Jac was getting “baby sliders” on in episode 26….aren’t they regular shoes hammered smoothly?? ……so my question is.. do the sliding shoes come in small… medium and large??? ..lol…. are there different thicknesses? ?